A laser transmitter is used to emit a plane of laser light across the job site. The plane mirrors the completed job site and is used as a reference point to ensure the blade is on-grade at all times. The blade moves up and down automatically to keep the base materials on-grade. Laser transmitters and rod-mounted laser receivers can also quickly determine the amount of material that needs to be added or removed from the site. 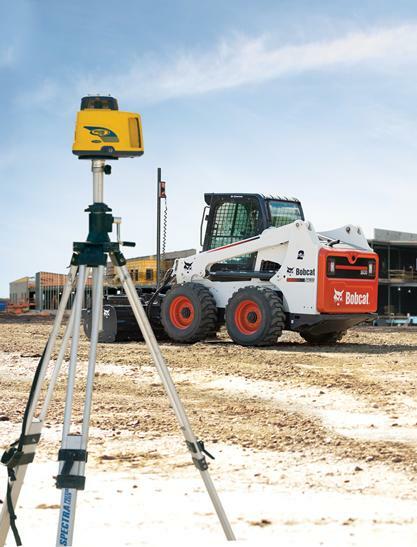 For a fully equipped laser grading system, Bobcat offers three laser transmitters: one single slope model and two dual slope models. For flatwork or simple grades, a single slope transmitter delivers excellent results. Both models of dual slope transmitters work well for anything from flatwork to compound set-ups. The laser control system increases precision when operating the box blade or grader attachment. Both the box blade and grader work well on flat and single slopes. On dual slopes, the grader attachment delivers increased functionality, with each side of the blade operating independently. Grader Attachment: Grade surfaces with precision and control while maximizing productivity with the grader attachment. Designed for use in landscaping, asphalt, curb and concrete flatwork, the grader attachment features blades that move six different ways and a front bolster that oscillates 12 degrees to the right or left, allowing for grading on any surface while minimizing the effect of uneven ground. Box Blade Attachment: Control grading operation with the accuracy and durability of the box blade attachment. The box blade incorporates end wings to help carry spoil and features elevation control, which allows the box blade to travel up and down slopes while still delivering accurate results. Using CANbus communication, the BLR2 laser receiver provides frequent updates (up to 20 times per second) to the control valve on the attachment, delivering high accuracy grading. Indicators and an automatic light on the face of the receiver also provide constant information to the operator. To make grade changes quickly from inside the cab, the “on grade” setting of the receiver can be moved up or down – up to 2 in. with certain machine options – for fast, accurate results. The laser receiver can also communicate with instrumentation of the loader. For a fully equipped laser grading system, Bobcat offers three laser transmitters: one single slope model and two dual slope models. Each model includes a hand-held laser receiver. All models feature two-way radio remote control to allow adjustments from across the jobsite or from within the machine. All laser transmitters also offer temperature compensation, ensuring the laser beam stays accurate as temperatures change throughout the day. Accuracy on the jobsite is critical, and a quality laser transmitter provides the high accuracy and the quick adjustment features necessary to get the job done right. On the jobsite, the laser transmitter is mounted on a tripod to provide a 360-degree plane of reference at a set elevation and slope. Laser receivers, mounted on a mast attached to the box blade or grader attachment, capture the light from the laser transmitter. In manual control mode, the receivers inform the operator via LED lights when the blade needs to move up or down, or to notify that the blade is on grade. In automatic control mode, the receiver informs the blade that it needs to move up or down to stay on grade. With the box blade attachment, one receiver – mounted in the middle – moves the entire blade up or down. With the grader attachment, two receivers are mounted so that so each side of the blade will adjust independently. Laser Receivers: Deliver a 360-degree operating range. Provide visible indication of where the blade is relative to the ground and an automatic mode indicator. Increment/Decrement Feature: Move the grade up/down, in 0.1 in. (or 2.5mm) increments up to 2 in. in either direction, making it easier for the operator to make adjustments on-the-fly without leaving the cab to raise or lower the transmitter. Quick Mounting and Set-up: For ease of use around the jobsite, the laser control system is quickly attached and removed as necessary.